Conifers are trees, shrubs and occasional ground covers that produce cones. Many conifers, like pines, firs, and spruces have needles. Others, like cypresses, junipers and false cedars, have scale-like leaves. Many conifers are evergreen throughout the winter, but a small few, like larches and dawn redwoods, are deciduous and change color in autumn before dropping their needles. You can identify most conifers by their distinctive cones. Eight Reasons to Plant, Maintain and Cherish Conifers. Evergreen conifers reduce surface runoff – year round. Unlike deciduous trees which drop their leaves in winter, evergreen conifers grow and absorb groundwater throughout Seattle’s winter rainy season. By sucking up rain, conifers reduce the run-off that pollutes our lakes, rivers, streams and waterways. Conifers can stabilize slopes and prevent slides – for hundreds of years. Most conifers are long-lived and thrive in the poor-to-moderate soil and hilly terrain of Western Washington. Correctly planted and cared for by arborists and alike, conifers can anchor slopes and prevent soil erosion. Natural birdfeeders, conifers sustain a variety of wildlife. Chickadees, wood warblers, and nuthatches dine on tiny insects they find in conifer branches, bark and cones. Finches forage for seed they find in broken cones. Berry eaters, like bluebirds, robins and thrushes, feast on the fruit-like seed cones of the juniper and yew. A variety of conifers add structure and interest to your garden design. Ever since the 19th century explorer and plant collector David Douglas sent seed cones back to Scotland’s Kew Royal Botanic Gardens, Pacific Northwest conifers have added elegance and architecture to formal built gardens. Varying in height, texture, color and smell, conifers offer yearlong interest to any landscape. Properly placed, conifers provide a living privacy screen. Many conifers, such as our native hemlocks and red-cedars, have thick evergreen foliage and sweeping low branches that can block unwanted sights, both in your yard and outside! Conifers also can be effective noise barriers. Conifers keep our air fresh and clean. 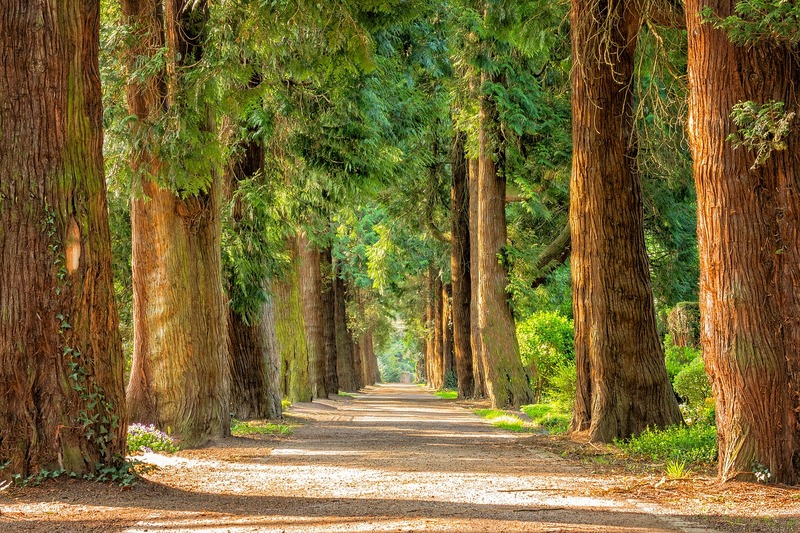 Not only do most conifers have pleasant aromatic scent, they also cleanse the air by trapping airborne dust and other pollutants in their dense foliage. Like all trees, woody shrubs and herbaceous plants, they store carbon and release oxygen. Conifers reduce energy costs and reduce your carbon footprint. A tall conifer can give you shade in the summer and a wind break in the winter. Our cold, artic winds can easily wick away your homes heat. A strategically planted tree can keep you comfortable and save you money. In our maritime climate, conifers thrive and need little maintenance. Our native conifers (and many species from Asia) love rain and coastal fog. Although you must water recently planted tree in times of drought, after a few years most trees won’t need summertime watering. Choose carefully: if you plan for your conifer’s eventual size and shape, almost no pruning will be needed. Think: the right tree in the right place. Topping deprives a tree of its lead branches and invites decay into the trunk. Most trees never recover from topping and slowly die. The upward growth following topping is weakly attached to the main trunk and can break off during normal winds. Remove English ivy and other vines from the trunk. Unmanaged, English ivy will grow into a tree’s canopy. Over time, this excess weight and leveraging caused by English ivy can pull a tree down by it’s roots. This scenario can destabilize slopes and cause high levels of surface soil erosion. Click here to see damaged slopes from English Ivy pulling down trees in Port Angeles. English ivy also harbors unwanted pests like rats and invites decay into the tree trunk. Consider the eventual height and girth of the conifer. Make sure you have appropriate space to plant a large conifer. Consult our arborists to determine the the right tree for your location. Remember: the right tree in the right place. Trees under power lines must stay below 20′ at maturity. Choose a variety that will do well. Some conifers prefer sun, others, like hemlock and red-cedar, prefer shade. Some pines are evolved for dry, fast draining soil while others prefer moist soil. Installing the right tree in the right place alleviates complex biological conflicts in the future. Our arborists can help make the right tree decision. Prune carefully, if at all. No tree wants to be pruned. Pruning is for the built environment of which trees are not from. Most conifers require very little pruning. Some trees, like cypresses and junipers can be shaped and sheared into hedges.